Raymond Aikens graduated from the Worsham College of Mortuary Science, later becoming a licensed funeral director. He currently teaches at Malcolm X College in Chicago and serves with his family at an independently owned and operated facility A.A. Rayner and Sons. He also holds an MBA from Indiana University, Bloomington and a BSE in Education from Northern Illinois University.embalmer. He also completed college and graduate school, majoring in Education, then Finance and Economics, respectively. Ray initially worked as a Commercial Banker at a major money-center bank in Chicago. He specialized in financing the activity of the broker/dealer community in Chicago and New York. Later he transferred into the Investment Department where he developed a specialty in municipal finance. Over the course of his career, Ray has taught throughout all levels of the elementary and secondary education system in Illinois. He now serves on the faculty at Malcolm X College of Mortuary Science. 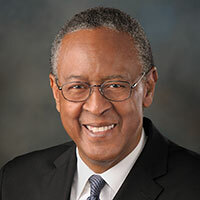 Ray is the former Illinois Manager in charge of Corporate Development for a now defunct funeral acquisition company and participated in the nation’s first purchase of an African-American owned funeral home and cemetery combination facility. He has published numerous articles in leading industry publications, lectured, and delivered keynote address before professional bodies in both the US and South Africa.